Designed to eliminate the glare associated with glass porch light fixtures, the Chamberlain series directs light output in an up/down beam spread. Petite in size, the brass body is ideal for small niche areas. Advance applications include mounting a horizontal series of Chamberlains to create a beautiful pattern of light. 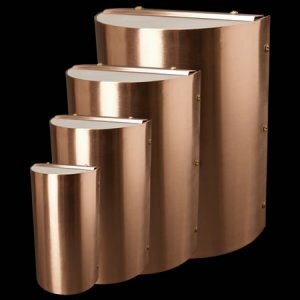 Available in 4 inch or 6 inch heights, these wall sconce fixtures are equipped with 20 Watt Astro-Brite, 10,000 hr. Xelogen lamp, 25’ of #18/2 low voltage wire and a 15 Year Warranty. For use with a halogen lamp (Chamberlain 4) or Xelogen lamp (Chamberlain 6) up to 20W max. FLEX™ Series LED lamps are available in 1W or 2W T3 lamps. LED lamps are available in 3000K color temperatures. FLEX™ Series LED lamps sold separately. Natural Copper finish is standard. Unique™ Lightings’ Natural Copper finish is a “living finish” and will naturally patina and change over time. Polyester powder coat finishes are also available.